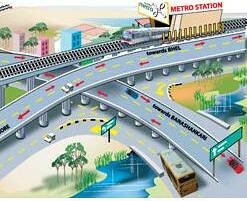 Saw in the news today the renders of the proposed flyovers plans for the mysore road and ORR jn..I simply went bonkers! It has been in news since some time that BBMP is planning underground parking lots under playgrounds and other public amenities like parks etc..
more on this in this link.. So the routes, at least the end points, are finally out from the DPR for PH II. I still dont understand what makes the DMRCL a better authority to develop these reports, no Idea of what traffic studies were done and what surveys were done..never heard of any..thought these are the basic inputs for putting out a plan report.. I was completely taken aback when I saw stumps of the tall silver oaks in front of HAL engine div today morning..
FW: Blr Autos - Have you been taken for a ride lately? Forwarding will help for all of us ... FYI Bangaloreans. Are trees needed in this city? Very unfortunate but many in this city seems to hate trees now, trees get bad press when they fall during rains and storms. We like the shade they give, especially during hot summers, but also curse them for the jams created after a storm..fallen branches etc..
1. A Weak Branch Union occurs when a branch and stem (or two or more co-dominant stems) grow so closely together that bark grows between them, inside the tree. The term for bark growing inside the tree is “included bark.” As more and more bark is included inside the tree, the weak union is formed that is more likely to fail. Delhi/Mumbai get wider spans...not Blr why? To expedite the process and make it more cost effective, Delhi Metro Rail Corporation (DMRC) is making use of gigantic 25 metre-long girders to join spans on elevated stretch of the section. ‘‘The cost of construction with the existing 3-meter spans works out to Rs 24 crore per km, while the 25-meter ones cost Rs 19 crore per km. So using the bigger spans will result in a saving of nearly Rs 5 crore per km,’’ said a DMRC official. The bigger spans work out to be more economical and also speed up pace of the construction. Officials said it takes about a week to join the space between two pillars using segmental construction while the bigger spans can be put in place in just one day. There was a recent comparison of the UP state Yamuna expressway and BMIC by the editor of Vijaya Karnataka news paper..
"Kempe Gowda or Majestic bus station may soon become history as the government has initiated the process of decentralization of the bus terminals. BMRCL Ph II DPR route? JnNurm funds are being used and announcements being made by BMTC about launching new busses on Blr roads..everything is being done in a hurry.. They are saying about 200 of Marcopolo's will be ordered..are they worth it? They cost 20-30% less than the Volvo's but have been found lacking in refinements which are basic at that cost! 1. The engines are way too noisy...even on normal roads..the bus struggles to start and passengers in the bus can hear the loud engine..even people in the traffic arround the bus can hear the loud noise! 2. The AC is not efficient..there are reports of passengers sweating inside the bus! With all the issues, is it really worth going for these busses..
Should we just go for such busses than the Marcopolos?